Gordon Korman is simply magic. This has been the Year of Korman in grade five. The students flew through the Dive, Island, and Everest series. A few are trading copies of Swindle. Next, they are going to love Ungifted. After a series of humorous events, troublemaker Donovan Curtis is accidentally sent to a school for gifted students, where he most definitely does not belong. Everyone knows it, but Donovan brings so much life and unpredictability to his new school, that they want to overlook it. Unfortunately, no one can run away from their mistakes, and hiding them makes it harder for everyone (a great lesson for middle grade readers). 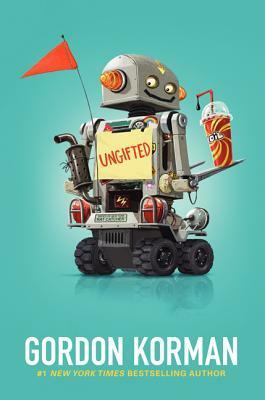 Luckily, things tend to work out for characters like Donovan, and Ungifted is no exception to that rule. This is a genuinely funny book that will have readers rooting for Donovan. The gifted and "normal" students are fairly stereotypical, but I think readers are smart enough to know this. I love the personal growth that I saw in the characters, particularly Donovan. In many ways, he is a typical middle school student, full of unthinking actions and fearful of consequences. Readers will relate to his impulsivity and the way that he thrives wherever he is placed.